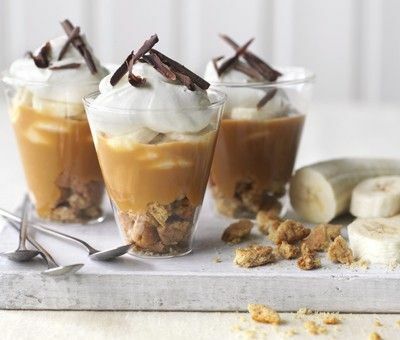 We all love our classic banoffee pie, but here's one that's a little lighter but still truly delicious and it has at least 30% less calories. And very quick to make too! 1. Crumble the biscuits and divide between 6 little glasses. 2. Spoon the gorgeous Carnation Caramel over the biscuits. 3. Top each with banana slices. Whip the cream and then fold into the Greek yogurt, finish the pots with a blob of the creamy mixture and a sprinkle of chocolate. Dive in! Am I able to use 0% fat natural yogurt instead of the 2% fat Greek yogurt? Hi Laura, Greek yogurt tends to be thicker than natural yogurt. 0% fat natural yogurt will be ok but 0% fat Greek will be even better. Hi Lynsey, yes the light and standard condensed milk are entirely interchangeable in all recipes. Happy cooking! Hi Amanda, we tend to make up as many as we need as we need them because they are so quick to make! But they should keep fine for up to 3 days. The bananas will go a little brown after a day or so but they still taste delish! How big do the glasses need to be to fit the dessert neatly? Hi R (we're intrigued what does the R stand for?) standard size wine glasses or small tumblers are good for these - or you can fill into small dessert dishes if you prefer...? I am making the tonight for dessert, but I am having to use glass cups like the ones above but they are shorter and wider at the top, will this make a difference? Hi Megan, no we think your glasses will be fine! Or if you want you could use wine glasses instead? Light Banoffee Pots is rated 5.0 out of 5 by 1. Rated 5 out of 5 by Susie from Delicious dinner party delight I made these on two separate occasions for dinner parties and everyone loved them.